My SoftFlex™ silicone Spout with TouchFlo™ valve makes it super easy to drink and it's kind to baby's gums and emerging teeth. 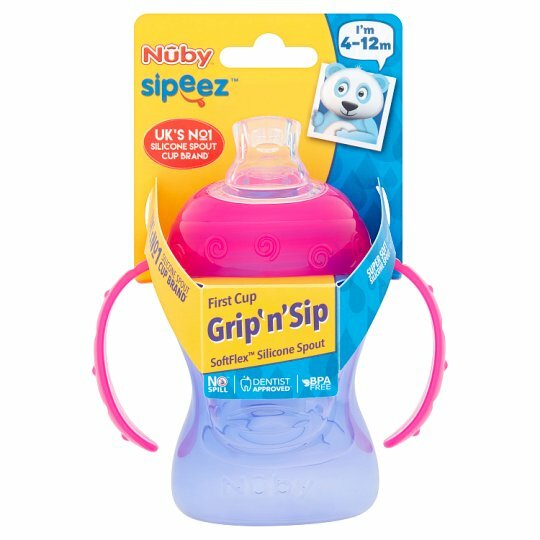 The No-Spill™ GripN'Sip™ is uniquely engineered with Easy Grip™ handles that are sized to fit your child's grasp. Engineered to make feeding and handling easier, designed with two people in mind, the No-Spill™ Cup is perfect for beginners. 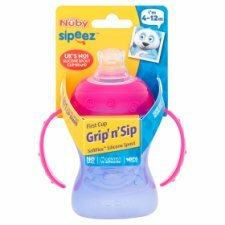 Your little one will find the transition from bottle to cup an easy one with the cup's soft silicone spout and the unique contour shape that easily fits their small hands. You will be delighted with the transition thanks to Nûby valveless, leak resistant design. 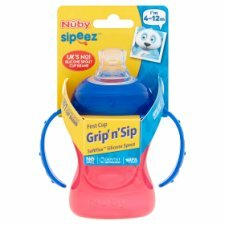 Spout: The soft silicone spout is uniquely designed to prevent drips and spills while being delicate and gentle to baby's gums and emerging teeth. The pressure sensitive Touch-Flo™ feature regulates fluid intake with sucking action of child. When sucking action ceases, the spout closes, ensuring a leak resistant cup. Squeeze Super Spout™ so that it can fit through opening in screw ring. Slide Super Spout™ into screw ring opening in an upward motion, making sure that the top of spout is correctly aligned. Push the remaining portion of the Super Spout™ through the screw ring, making sure that the spout conforms to the fitted grooves on the inside of screw ring. For your child's safety & health WARNING! Always use this product with adult supervision. Accidents have occurred when babies have been left alone with drinking equipment due to the baby falling or if the product has disassembled. Never use soft spouts as a soother. Continuous and prolonged sucking of fluids will cause tooth decay. Tooth decay in young children can occur even when non sweetened fluids are used. This can occur if a baby is allowed to use this type of beaker for long periods through the day and particularly through the night, when saliva flow is reduced or if it used as a soother. Always check food temperature before feeding. Heating in a microwave oven may produce localised high temperatures. Take extra care when microwave heating. Always stir heated food to ensure even heat distribution and test the temperature before feeding. Before first use, clean the product. Clean before each use. Always wash the product immediately after use. Wash in warm soapy water and rinse in clean water or use a dishwasher. Do not turn the spout inside out for cleaning, damage could result. Use a teat brush. Do not clean with solvents or harsh chemicals. Do not allow product to come into contact with oil based foods (e.g. oil/tomato based sauces) as staining will occur. Suitable for all forms of sterilisation. INSPECT BEFORE AND AFTER EACH USE AND PULL THE FEEDING SPOUT IN ALL DIRECTIONS. THROW AWAY AT THE FIRST SIGNS OF DAMAGE OR WEAKNESS. Do not store or leave in direct sunlight or near a source of heat. Do not store or allow to come into contact with solvents or harsh chemicals. Not suitable for use in a conventional oven or a combination microwave oven with the grill feature switched on. Keep all components not in use out of reach of children. Do not leave the spout in direct sunlight or heat or leave in disinfectant "sterilising solution" for longer than the recommended as this may weaken the teat. FOR SAFETY AND HYGIENE REASONS IT IS RECOMMENDED THAT THE SPOUT IS REPLACED EVERY 2 MONTHS. Do not heat in a microwave with the beaker sealed. Remove the lid first. Not suitable for fizzy (carbonated) drinks. Please retain these instructions for future reference.